Maria Tamburrino has been the Principal flutist and frequent concerto soloist with the San Jose Symphony and the Midsummer Mozart Orchestra of San Francisco since 1979. She is continuing in that capacity with the new Symphony Silicon Valley (2003). Her solo collaborations with harpists Nicanor Zabaleta and Susanna Mildonian, French hornist Hermann Baumann, flutist Julius Baker, and pianist Menahem Pressler have been widely acclaimed. In addition, she has performed all of the solo flute concerti by Mozart with both the San Jose Symphony and the Midsummer Mozart Orchestra on several occasions. She has been a featured soloist in Asia, Europe, The Philippines, Australia, and throughout the United States, and has appeared on several high-profile cruise lines. Maria Tamburrino’s playing has been described as “incredibly seductive, with vibrant tone and sultry persuasive inflections.” (The Times) “The radiance of Tamburrino’s flute was a source of auditory indulgence. Her fluid tone, spanning the instrument’s reach of registers, carried the music’s melodic essence with effortless-seeming elegance.” (San Jose Metro) “Maria, you are first rate. You could play anywhere. I haven’t heard a sound like that in a long time.” (Henry Mancini) “This is a piece for true artists, one that allows opportunity for an honest expression of heart and soul. Tamburrino did not miss the opportunity.” (San Francisco Examiner). She was recently referred to as a “woodwind wizard” (San Jose Mercury). Ms.Tamburrino has performed at the prestigious International Festival of Colmar with members of the Moscow Virtuosi and Vladimir Spivakov in the summer of ’99 and ’00. During subsequent seasons, she performed the Christopher Rouse Concerto with the San Jose Symphony, the Concerto in A Minor for Flute, Violin, and Harpsichord and Brandenburg Concerto #5 of J.S Bach with the San Jose Chamber Orchestra (on two separate occasions). She also performed the Stamitz Concerto in G and the Odelette of Saint-Saens with the Master Sinfonia Chamber Orchestra. Maria Tamburrino was asked to present high-profile flute master classes at the International Festival of Colmar in July, 2000. Her eclectic recitals and chamber music concerts in the bay area with piano, woodwinds, harp, and/or strings feature her tasteful transcriptions and her addition of alto flute and piccolo to almost every program. 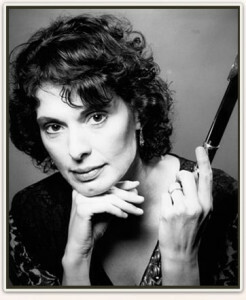 In addition to her CD of original transcriptions for flute and piano (works by Debussy and Ravel)Enchanted Garden, Maria Tamburrino’s extensive recording credits include an album for flute and guitar entitled Set 2, a tape of flute and harp music (Moonlight), as well as film and TV soundtracks. Flute Fantasy, a video featuring Maria Tamburrino playing a variety of flutes (with nature images) is a potpourri of “favorite flute pieces” and transcriptions. Born and educated in upstate New York, Ms. Tamburrino holds a Master’s Degree in Education and Performance Certificate in Flute from SUNY. She continued her graduate studies at Syracuse University. Her past teachers include Julius Baker, John Oberbrunner, Donald MacDonald, and Lloyd Gowen. She has participated in master classes with Jean Pierre Rampal. The radiance of Tamburino’s flute was a source of auditory indulgence. Her fluid tone, spanning the instrument’s reach of registers, carried the music’s melodic essence with effortless-seeming elegance. Her sheer beauty of sound provided an ideal realization upon which the orchestra worked earnestly to equal. Maria Tamburrino brought down the house with an aggressive, silvery performance that carried to the far reaches of the hall, with sweeping phrases and high notes as taut as a tightrope. Maria Tamburrino played with piercing beauty and a touch of hesitancy which was quite fetching. Soloist Maria Tamburrino’s playing was incredibly seductive, with vibrant tone and sultry persuasive inflections. Tamburrino has a gorgeous, rich sound and a clean articulation which she had ample opportunity to display in this concert. The low notes just boom out on her solid gold flute. Tamburrino showed feats of virtuosity and pyrotechnics with excellent control. Her sound texture recalled Jean-Pierre Rampal. San Francisco Chronicle Review (7/19/09) “Come to it with a free and fiery attitude, as flutist Maria Tamburrino did during Thursday’s opening program of the Midsummer Mozart Festival, and the results are electrifying. …Tamburrino, a festival stalwart for many years, tackled the G-Major Flute Concerto with fervor and pizzaz, illuminating Mozart’s graceful but oddly moody melodies with a sure hand; the alluring slow movement sounded especially poignant.